The workers making critical repairs to the Metrorail system say management is bullying, threatening and forcing them to sidestep safety rules, putting both workers and the public in danger. Employees who spoke at a Metro board meeting on Thursday said they worry about making a fatal mistake because they are being rushed to get work done fast. "WMATA is terrified of angering the public, but I'm more concerned with making sure they don't die. 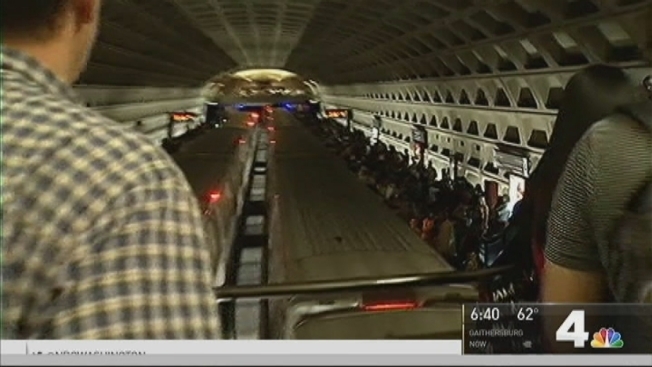 The public will get over being mad, but they will not come back to life," Metro employee Antonio Ross said. The workers also said they are worried about themselves, Raymond Jackson of Amalgamated Transit Union, Local 689 said. "Do you feel like you are safe when you are working out there?" News4's Adam Tuss asked. "Not all the time. No. I can honestly say not all the time," Jackson replied. Metro disputed the workers' claims and said that safety trumps service. Officials pointed to a spike in the number of cases in which tracks were taken out of service and trains were slowed because safety fixes were being made. "Whereas I think historically they would have said, 'Well, OK, we're going to do that later,' we're saying, 'No, we're going to deal with it now,'" Metro General Manager Paul Wiedefeld said. Many workers said that did not reassure them. "If there are work rules being broken to get this work done, it has to stop," Jackson said.